Our branch represents staff employed by Pembrokeshire County Council, Pembrokeshire College, National Park and private care and community organisations across the county. We negotiate for better pay and conditions, help individuals in trouble and campaign for a safer, fairer society. 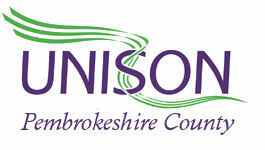 UNISON is Britain's biggest public service union, representing almost 1.3 million people across the UK's public services. This Friday is International Women's Day. And that's a day that is particularly important for UNISON – a union with more than a million women members working to provide key public services to people across the country. It’s a day that is is marked across the world, starting on 28 February 1909 in support of New York’s garment workers. It moved to 8 March as part of the UN International Women's Year in 1975. It's now 110 years since the first international women's day and UNISON will be sending a special U digital newsletter ahead of Friday to members, featuring an interview with Christina McAnea, UNISON's assistant general secretary for negotiations, bargaining and equalities.